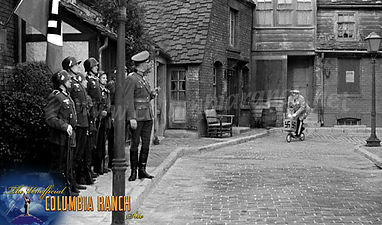 Constructed in April and May of 1935 for the movie 'A Feather in Her Hat', (with Basil Rathbone, Billie Burke and David Niven to name a few of the cast), this tiny little street represented a poor section of town of the fictional 'Little Egbert Street' in London England. 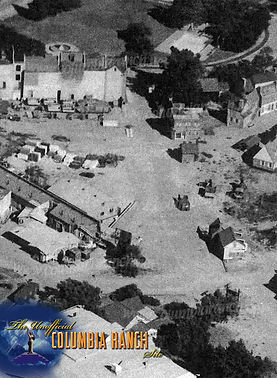 Complete with small shops and store fronts, cobblestone street and sidewalks, it was laid out like an 'L', so that one could not see the end of the street from one end or the other. A perfect way to make the set look bigger than what it really was. Little Egbert Street as it was first constructed in 1935. 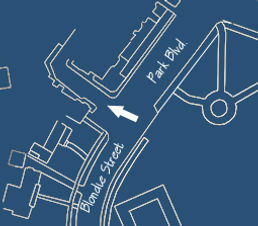 The street intersected where Park Blvd. and Blondie Street meet, and 'wrapped' around the back of what is now known as the Apartment buildings on Park Blvd. 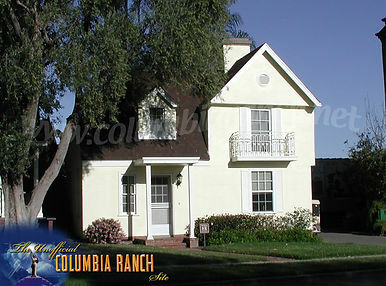 Originally built as "Clarissa's Corner Shop" for the movie 'A Feather in Her Hat', it was only a 3 sides structure. A front, one side and no back. It was not until a few years later that the structure received a gable and a roof. A capture from the movie 'A Feather in Her Hat' 1935. Little Egbert Street as it appeared around 1940. 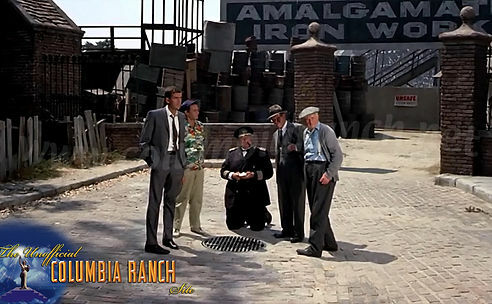 Over the next decade (1935-1945) the street was used often in many serials, such as 'The Three Stooges', 'Captain Midnight', and numerous others. 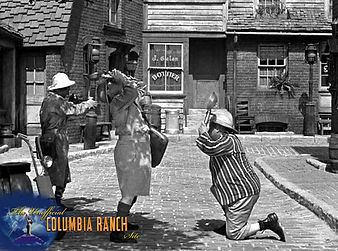 Three different Stooges Shorts showing Little Egbert Street as different locations. 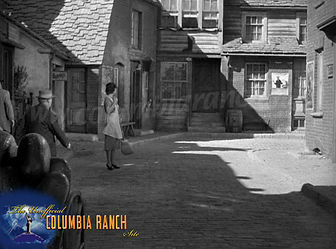 In the movie 'My name is Julia Ross' from 1945, the street can be seen in its whole for the last time. 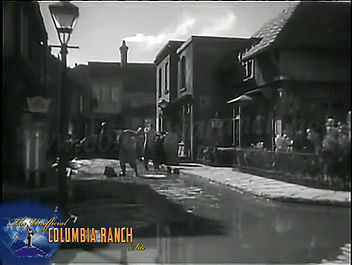 The original Little Egbert Street as seen in 1945's 'My Name is Julia Ross'. 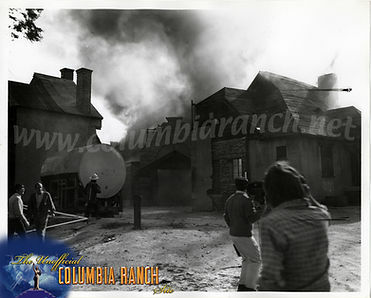 In 1953 a fire destroyed the original Park Blvd buildings, including the right side and back end of Little Egbert street. This section was never rebuild although part of the original sidewalk remained in place for many years after. 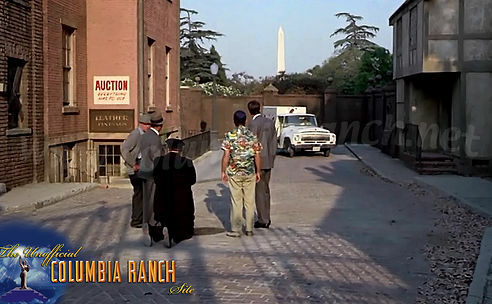 In 1962, the street was used numerous times for the movie 'The Notorious Landlady' with Jack Lemmon and Kim Novak, for which the back end was turned in to a cemetery complete with a 10 foot tall fence and graves behind it. 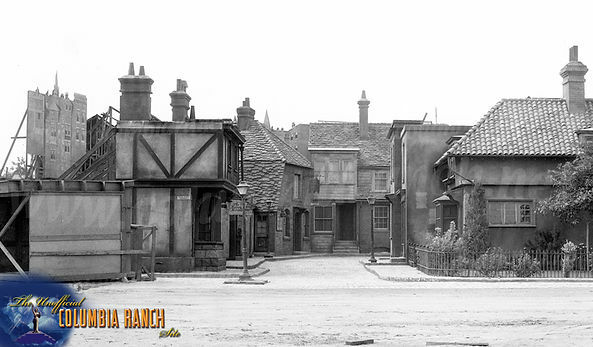 A stitched together panorama of the street from the movie 'The Notorious Landlady'. 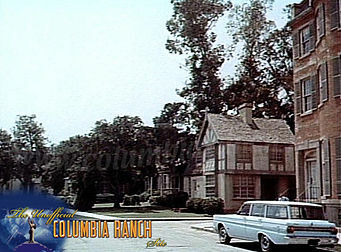 Just two years later the Little Egbert house was used again in the movie 'Village of the Giants' from 1964 and just shortly there after in 'Gidget', the series, with Sally Field. Many other shows of that time showed glimpses of Little Egbert, like 'Bewitched', 'I Dream of Jeannie', 'Dennis the Menace', and 'Search' for example, but none really used the house or the street it self that much. 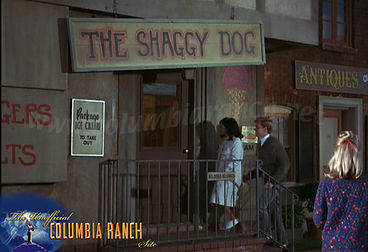 'Gidget' used the Little Egbert house as The Shaggy Dog hangout. The Little Egbert House as seen in 'Village of the Giants'. 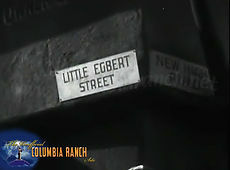 The last time Little Egbert Street made an appearance in this configuration was for the movie 'Who's Minding the Mint' from 1967. In it we see the street in some unconventional ways, including a high angle and a ground up shot. 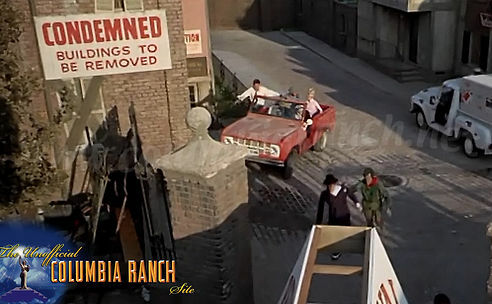 Captures from the movie 'Who's Minding the Mint' showing Little Egbert Street in 1967. During the major fire of January 1970, the back end of what remained of Little Egberts Street was cleared to make way for Fire equipment to pass as they battled the blaze. The many people at hand successfully kept the flames from spreading on to the structures there and the nearby Park Blvd buildings. Bobby Sherman and others trying to battle the fire near then back end of Little Egbert Street. Just a year and a half later, the area behind the Little Egbert house was extended and a 'new' street was created and lined with 'Colonial' like façades, resembling Chestnut Street in Boston, including a replica of the State House (Independence Hall) for the musical movie "1776" in 1972. A screenshot of Little Egbert Street as seen in the musical '1776'. Near the center right, the Little Egbert house is visible. 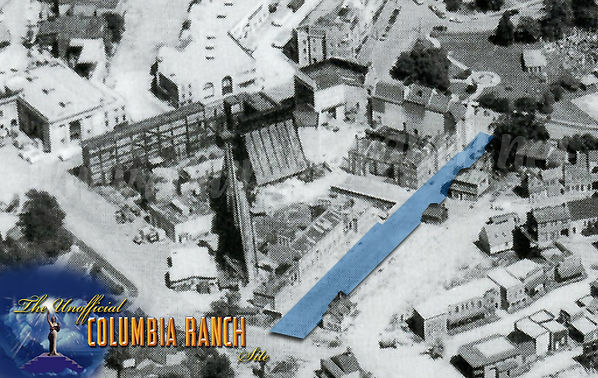 As highlighted below, the street reached from its original intersection at Park Blvd and Blondie Street, to the crossroad between the Commissary and Western Street 'A'. A wonderful aerial of the street in 1973. Visible is the 'Independence Hall' and the full extent of the street. Sometime between 1974 and 1977, the 'Independence Hall' and most other facades on the new street were torn down, and much of the area was cleared and leveled, with the exception of the Little Egbert House itself. An aerial view of Little Egbert Street from 1977. 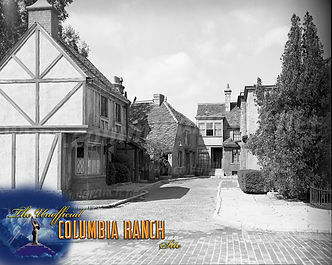 Of all the facades that once graced the littlest street on the Ranch, all that is left of the original Little Egbert Street today, is one structure, the small corner house that once wore a Tudor Style facade, and called Little Egbert House. The street itself is only as an alley way, used by the Greens Department for plant storage and the occasional Golf Cart. 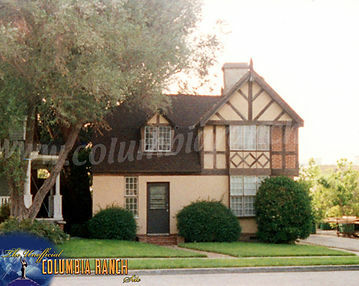 The Little Egbert House as it appeared around 1996. The Little Egbert House today.